Johnson & Wahlberg (above) Harris (below)Michael Bay’s Pain & Gain is a very dark comedy masquerading as an action film. It’s based on the true life crimes of a trio of bodybuilders in 1990s Miami who, in pursuit of the “American dream,” careen into violence, kidnapping, and murder. The cast is terrific. 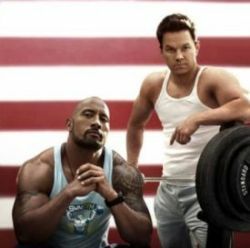 Mark Wahlberg and Dwayne Johnson shine. Ed Harris adds his gravitas. But this is not a typical “caper” movie. Stupidity and evil lurk beneath the surface here and become increasingly intertwined as the movie progresses. Don’t let the director’s reputation scare you away from this one. At the same time, don’t expect a lighthearted romp.